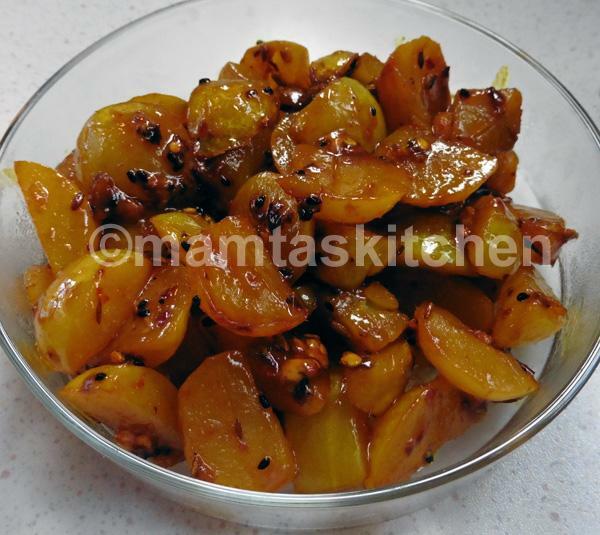 This dish is very popular in North India, specially since Amla is considered to have many medicinal properties. It is eaten like a pickle, in small quantities. This recipe is from my mum, Yashoda Gupta. Serves 4-6 as a side dish. Unlike Western Gooseberries which grow on plants, Amla is a fruit that comes from big trees. Each fruit has a hard stone at its centre. Amla is a rich source of Vitamin C, which is not all destroyed during cooking. It’s dried fruit is powdered and added to many Ayurvedic stomach remedies and often used in traditional Indian hair shampoos. Amla oil is considered an excellent tonic for keeping hair strong and shiny. Vitamin D in it helps to absorb calcium and strengthens the bones. It has diuretic, laxative, cardio-protective, cooling, and anti-infective properties. It’s antioxidants help to keep Cholesterol down. 1 tsp. Panch-pooran/Phoran. If you don’t have this, use mustard seeds or Nigella seeds or a mix of mustard and fennel seeds. Wash and towel dry amlas. Slice off the flesh from the stone using a sharp knife. The safest way to do this is to hold each amla firmly on a chopping board and slice flesh off from all four sides. Heat oil in a pan and add panch-pooran. As the seeds begin to splutter, add everything else. Give it a good stir and turn the heat low. Cook covered on low heat until cooked. They should become soft, but not be mushy. Stir in sugar until it is well mixed. Taste and adjust seasoning ans sweetness. Serve hot or at room temperature with Plain Paratha or as part of any Indian meal.